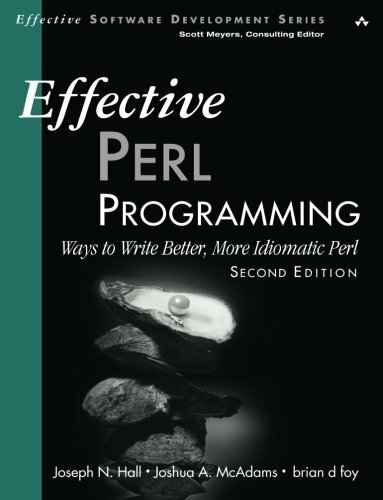 Amazon.com description: Product Description: The Classic Guide to Solving Real-World Problems with PerlâNow Fully Updated for Todayâs Best Idioms! For years, experienced programmers have relied on Effective Perl Programming to discover better ways to solve problems with Perl. Now, in this long-awaited second edition, three renowned Perl programmers bring together todayâs best idioms, techniques, and examples: everything you need to write more powerful, fluent, expressive, and succinct code with Perl. Nearly twice the size of the first edition, Effective Perl Programming, Second Edition, offers everything from rules of thumb to avoid common pitfalls to the latest wisdom for using Perl modules. You wonât just learn the right ways to use Perl: Youâll learn why these approaches work so well. Youâll learn how to work with strings, numbers, lists, arrays, strictures, namespaces, regular expressions, subroutines, references, distributions, inline code, warnings, Perl::Tidy, data munging, Perl one-liners, and a whole lot more. Every technique is organized in the same Items format that helped make the first edition so convenient and popular.